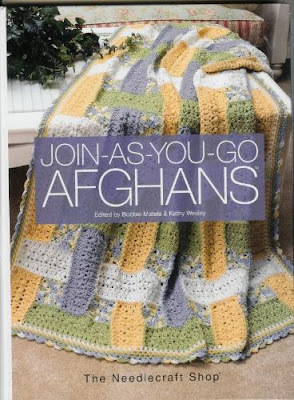 Crochet Living: Join-As-You-Go-Afghans is now in paperback! I'm proud to say that I have three designs in this book! Published by The Needlecraft Shop and edited by Bobbie Matela and Kathy Wesley, Join-As-You-Go-Afghans is a collaboration of 16 designers, including Carol Alexander, Brenda Stratton, Tammy Hildebrand, Bonnie Pierce, Ann E. Smith, and Martha Brooks Stein, just to give you an idea of the talent. My own three designs, "Christening Rose"--a pure white Irish rose motif, "Poinsettia Beauties"--a fabulous 3-D Bright Red flower with a Yellow center and Hunter Green background, and "Patriot's Picnic"--thirty-five 8 inch squares with a Snow White 5 pointed stand-up star center and Navy Blue frame, followed rows of Cherry Red and White, are Granny Square type blocks. You can easily make each one individually and then join them with another method. Mostly using the easy to find knitting worsted, there is a chapter called Furry Frenzy that will help you use up your Fun Fur stash. I was also happy to see an afghan called Velvety Roses. It's made with 5 skeins of Lion Brand Chenille Thick and Quick in 5 different flower colors and 5 skeins of Lion Brand Wool-Ease Bulky for the background color and uses a P hook--super quick and easy! If you like making afghans and collecting afghan books, you will enjoy your purchase.